"His Way - Sinatra's Centennial Celebration"
One of Chicago’s Award Winning Entertainers, Ron Hawking, knows how to deliver a performance that truly comes from his heart. And, it’s that special quality that allows him to touch the heart of his audience every time he walks onto the stage. Then, at any moment, he can seamlessly step in and out of any personality he chooses to portray. Going well beyond simply creating an impersonation, Ron has an uncanny ability to reinterpret a song and redeliver it with the same vocal charm and charisma that made the original artists so beloved. In February, 2014 the Chicago Music Awards honored Ron Hawking with the 2014 Lifetime Achievement Award. 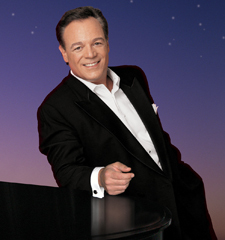 In 1998, Ron Hawking created, produced and starred in the smash hit show, "His Way" A Tribute to Frank Sinatra. In 1999 he went on to produce and star in the West Coast production of His Way at San Francisco’s Theatre On The Square. The show also played in Las Vegas, as well as other major cities, before returning to Chicago. In September of 1998, Hawking wrote the music and lyrics for "Go Go Sammy Sosa" as a salute to the Chicago Cubs superstar. In addition to major media coverage and airplay on national radio and TV, the song made its Wrigley Field debut at the final home game of the Cubs’ 1998 season. Continuing his run with His Way, In 2002 Hawking opened the His Way Theatre inside studio A at Chicago’s NBC Tower and the show became one of Chicago’s longest running musicals. The "His Way" album, which Hawking also produced, received distribution and airplay not only in the United States, but on the United Kingdom’s BBC as well. Ron Hawking has performed at New York’s Carnegie Hall with the 40 piece Philly Pops Orchestra under the direction of pianist/conductor Peter Nero that celebrated singer Patti Page and her 50th Anniversary in show-business. Ron has also opened for such notables as Carol Channing, Sheena Easton, Robert Klein, and The Temptations, just to name a few.